There's plenty of learning ahead for a college-bound student, but you may want to provide a quick lesson on managing personal finances before classes start. You can get caught up discussing student loans and other ways to pay for tuition and room and board, but don't forget to talk about day-to-day finances. 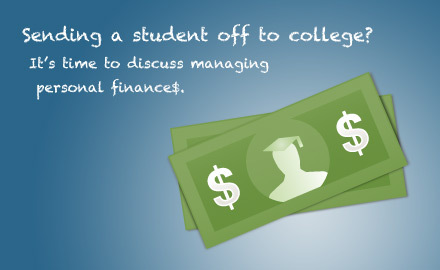 First-year students have a lot on their minds as they begin college—class schedules, dorm room decor, cafeteria food—but they should also keep managing personal finances top of mind. Consider cosigning for your child's credit card to help build credit in his or her name. The card could be used for emergencies or purchases made with your blessing. Before your kids begin their college careers—and gain a whole lot of experience through their newfound independence—make sure you've chatted with them about personal finances too. They may even thank you … one day. *Source: "Always Leave Home Without It: A Further Investigation of the Credit-Card Effect on Willingness to Pay."